Mrs. Burgerdogboy wandered thru the Irvington Whole Foods the other day, after a nearby appointment for her work. She picked me up a two-pack (I always make a bad “Tupac” pun, just to make her groan) of Whole Food’s refrigerated Whole Wheat pizza crusts. Being a guy, and not prone to following directions on any package, the first one I made didn’t turn out as well as expected – I baked it on the pizza stone, which, with some crusts, ends up having a negative effect, to wit, the stone traps moisture in the dough, re-releases it as steam, and the crust does not get as crispy as the manufacturer probably intended. Nevertheless, the first one had a certain amount of crunch, tantamount to a pizza crust that resembled one made with matzoh cracker dough – which I did not find terribly unappealing, actually. The second time around, I followed the instructions to the letter. (WTF?). 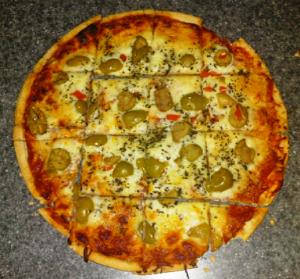 I topped my pie with Contadina Pizza Squeeze, a product I really like, salad olives from the Olive Pit in Corning, CA, which I have written about before. Salami from the Batali’s saluma-teria in Seattle crowned the cheese. The packages says bake at 400 for 10-12 minutes, but doesn’t specify whether to put it directly on a rack or pan. I went for the rack today to see if it produced a different result than the stone, and the answer is “not really.” The top photo is the uncooked crust, and below is the finished product. Note the docking holes on the unbaked crust; the bottom has ‘score lines’ as if grilled, and I am not sure of the purpose of that. I dod not think these were par-baked. You will notice a couple of pieces of the crust broken off. I am sure this is a result of becoming dried out due to my throwing the package in the freezer when I got home, and clearly, this product should only be refrigerated until used.